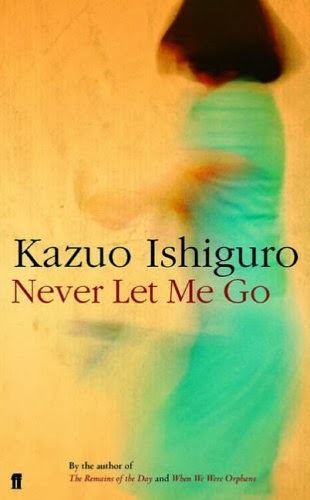 After having a few friends recommend this book to me, I was expecting to write a gushing review of Kazuo Ishiguro's award winning novel Never Let Me Go, however I can tell you now that I wont be doing that. I bought the book last summer, hoping to read it whilst sitting in the back of my dads car during an excruciatingly long car ride, however as the weeks went on the book just gathered dust on my shelf, along with the others that I also swore to read that summer. I finally decided to pick it up a few weeks ago, and after hearing so many good things about it I honestly thought it was going to be one of the best books I would read in my lifetime, sadly I was mistaken. I stopped reading just shy of one hundred pages, as I couldn't take reading about this girls uninteresting school life at Hailsham any longer. The opening of the novel draws you in; you learn that the protagonist and narrator, Kathy, is a carer, and immediately start wondering who she is caring for. As the novel progresses, we find out that she has been caring for people she used to attend school with, and it's presumed that she may be a nurse. So far it sounds like it could be a good novel, and you're probably thinking this book doesn't seem too bad, well let me change that for you. I have read 98 pages of the book, and nothing has happened. Nothing. A few select conversations and events have led to me thinking that perhaps once she's finished reliving her time at school, the novel may actually drastically improve, but the more I read on, the more I wanted to choke the narrator to death. Saying that she was beating around the bush, would be a complete understatement, what she was doing, was beating around the whole forrest, and then some. The 9 chapters I read were spent telling us how their teachers 'The Guardians' were a little bit shady, how they had their art work taken by Madame, and that they had sales where they could buy and sell each others creations, as well as stuff that came in from outside the school. Although some of the event's she spoke about were quite laughable, I had grown bored of this novel by the forth chapter, but I carried on reading due to the large amount of praise surrounding the book. Five chapters later, I had had enough. Obviously all this back story was necessary, otherwise the editor would have crossed it all out in a big red pen and told🐟 Ishiguro to actually write something interesting, but the more I read, the angrier I was becoming. I wanted something to happen, anything! Finally around chapter 8, one of the guardians had an outburst essentially telling the children about their futures, but soon after the plot falls placid, and returns to it's original tedious state. At this point, I didn't care if any of my theories as to what was happening, or why she was caring for these people were correct or not. I was just so mind numbingly bored of hearing about her life, that I threw the book at the wall and declared war on it. I have only thrown one other book at the wall and that was Sebastian Faulks' Bird Song, but that rant is for another post. I'm not sure how long she carries on reliving her childhood for, but I do know, that if I had read one more page I probably would have done a lot more than throw the book at the wall. I googled the book this morning, to see if any of my theories were correct, and unsurprisingly they were. This probably says more about my abilities as a reader, rather than Ishiguro's writing skills, of which are a lot better as a whole, compared to the content of his novel. The way he has used language is fantastic, his strong descriptions of the school, and grounds evoke imagery that is much sought after by novelists. Obviously I can't discuss literary techniques used in the latter half of the novel, as I refuse to read it, but I am sure they are equally as good as those in the first half. If you were to ask me as a friend, I would swear you away from this book, stating that it was one of the most boring books I have ever read, and that I had no idea as to why it had won an award, but as I am supposed to be being professional, I'll say this instead: Despite the lack of plot, what I have read of the book is well written, and I can only presume that it is well thought out and provides relevance in the second half of the novel; however, as there is an absence of plot, there is nothing driving the story forward. I would love to say something positive about the novel too, but in order to do that, I would have had to have a positive reaction towards something in the novel, of which I didn't. Maybe I am just being bias, or maybe everyone else just really bad taste in literature, but I cannot see why everyone seems to love this novel. If you've read it why not share your thoughts on the novel below, it will be interesting to see if you guys agree, or even why you thought it was so good!